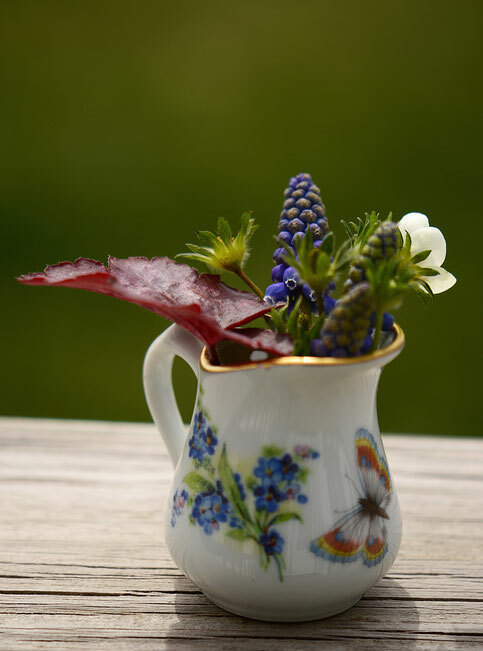 The vase in question is a tiny vintage French creamer, its surface splashed with flowers and one largish butterfly. 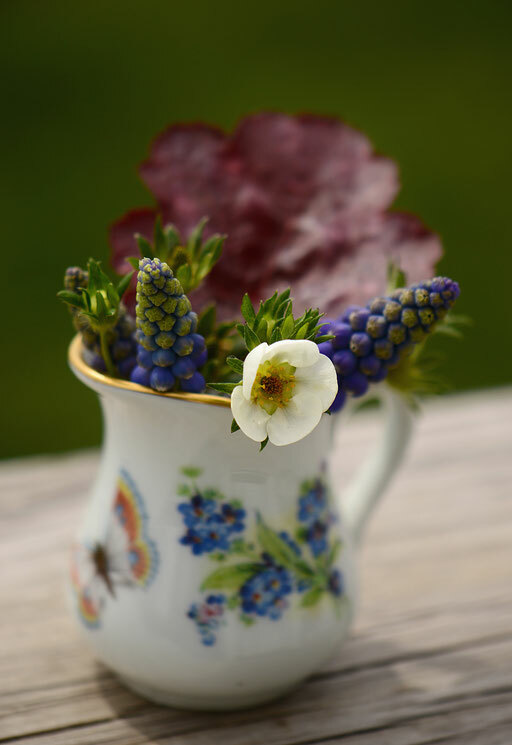 Although I have as yet no forget-me-nots, it was a good choice for the small flowers going into today's posy: a few spikes of found Muscari, a strawberry flower, and a bright Heuchera leaf. Thanks to Cathy for her inspiring theme, all about bringing the garden's beauty indoors to be enjoyed a little more. 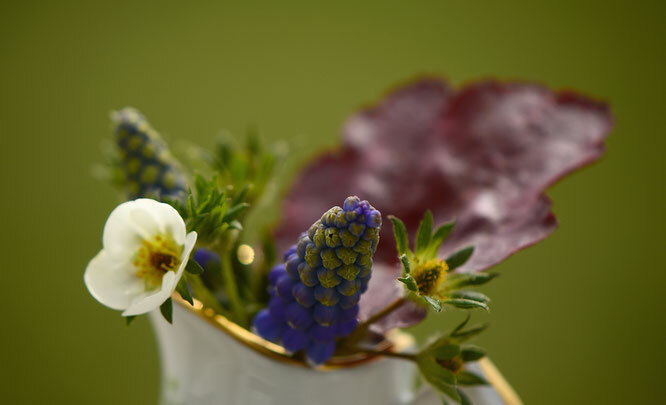 Do check the many vases linked at Rambling in the Garden! Inspired by your amethysts, I realised that the 2 Plectranthus growing on opposite sides of our house, are not mother and seedling - but 2 quite different plants. One large and lilac, the other small and deepest amethyst! It's a sweet little arrangement, Amy, and the creamer is the perfect vessel. Cathy - Who knows what else?! We think that possibly there is an old grape vine along the fence. In any case it is so good to be growing things again, even just a few! I had forgotten how much plants like this crispy cold weather! That is so lovely Amy. 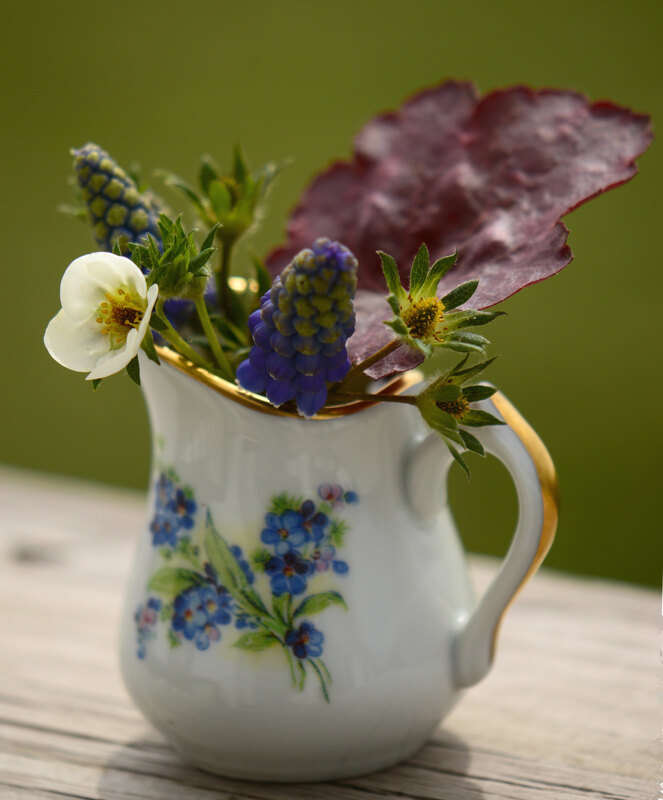 It just goes to show how little we need to make a little spring posy to cheer our homes. Your photos are lovely too. Have you noticed a difference in light between your old and new home? Diana - That is exciting to have so many amethysts! :) I love seeing how plants create so much variety on their own! Kris - Thank you so much; the strawberry stem is continuing to open new flowers so it's been an ongoing pleasure! Cathy@Words and Herbs - Yes, it took surprisingly little, and the strawberry stem is continuing to keep us supplied with new blooms. I can only hope to get strawberries on the same scale! There is a vast difference in the light here; after all, the light in the Sonoran Desert is like no place else on earth, unless maybe the Sahara! ;-) I am having to learn to adjust to more normal photography conditions!